Last week I was able to throw a baby shower for a friend that I go to church with. 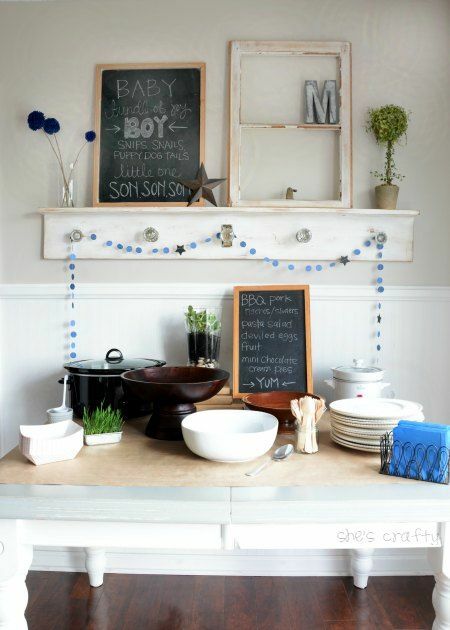 We didn't have a specific theme, so I did chalkboard, blue and stars. 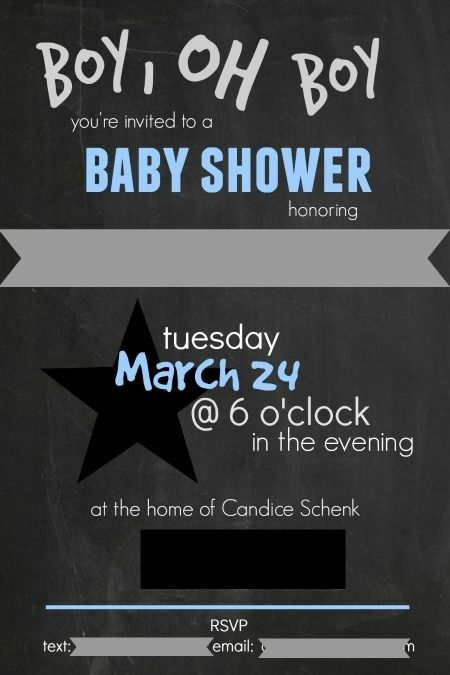 I made the invitation in Pic Monkey and printed them on white cardstock. 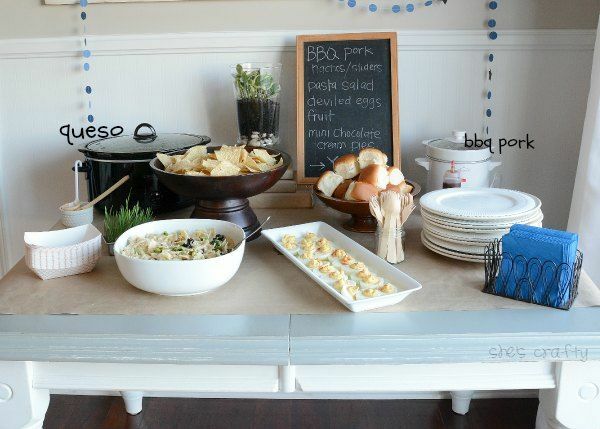 that the guests could either make sliders or nachos. 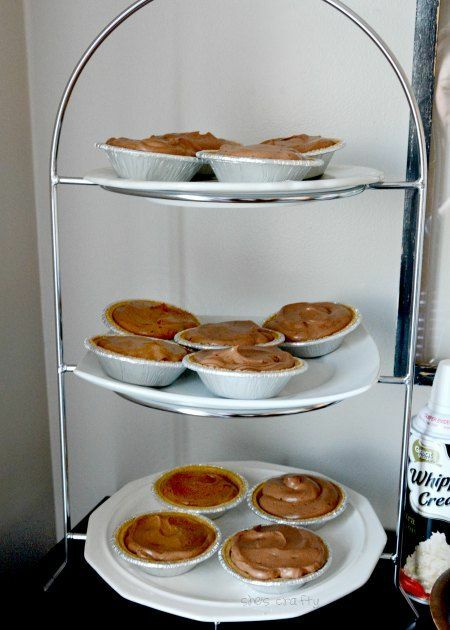 and mini chocolate cream pies with spray on whipped cream. These were so yummy! They were also very simple. I'll have to do a post later that I devote just to these delicious little treats! 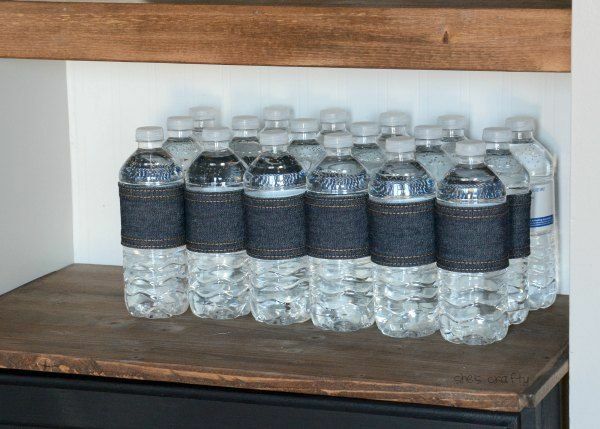 For drinks, we had water bottles that I wrapped with denim ribbon. My favorite part of any party is the decor. 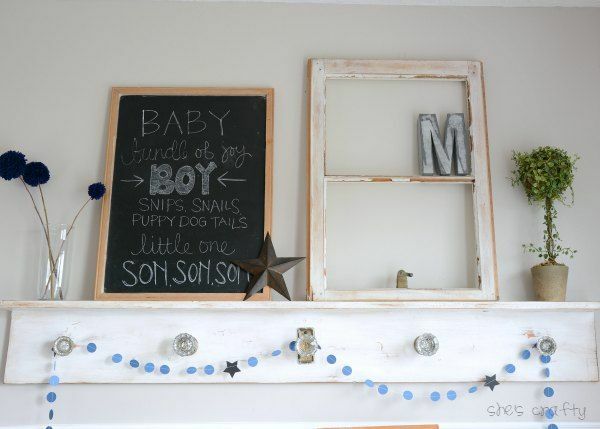 I kept this pretty simple with an old window, a chalkboard. navy pom poms, a star and a topiary. I topped it off with a galvanized metal "M", which is to be the baby's first initial. 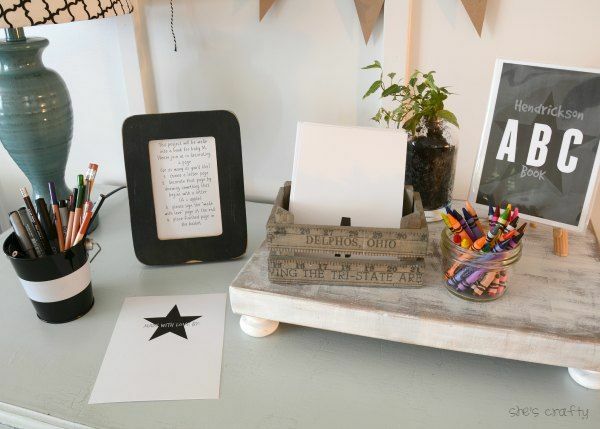 I made a little advice display. but I figured some mommy tips for 2 kids couldn't hurt. I made the tags by cutting out 3 x 4 rectangles from kraft paper. I cut the edges off to make a tag. Then I punched a circle. I hung the tags with push pins on black foam core. The pen holder is a ruler that I cut down and drilled screws into. 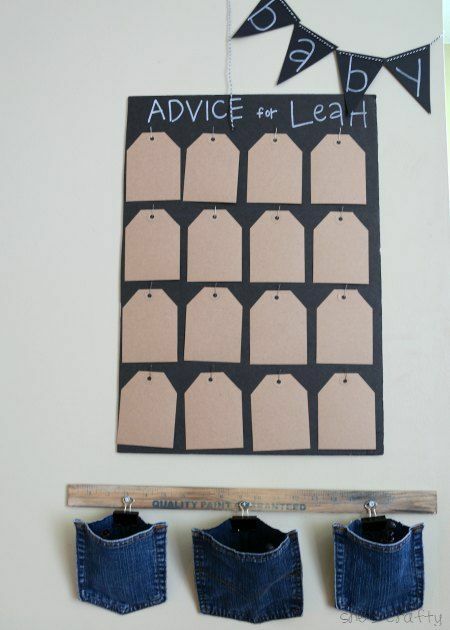 Denim pockets are held on with binder clips. I sent this home with the mom so that she could use it to hold diaper cream or paci's or any other baby supplies. We also had a DIY alphabet book. I cut white cardstock down to 5x7. Then I stamped each page with a letter of the alphabet. For the album, I used a small plastic photo album. I took all of the papers out of it and made a new cover in Pic Monkey. The ladies that came to the shower drew pictures that corresponded with each letter. I sure wish I had taken photos of some of the pages. There were some darling ones!! We had lots of yummy treats sitting around. 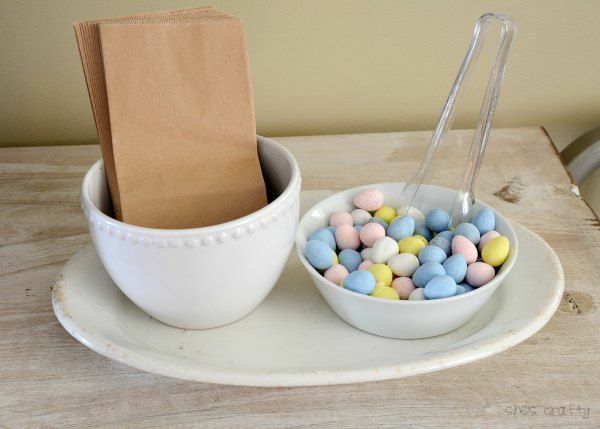 I had these cute little kraft sacks so the guests could take some home with them. 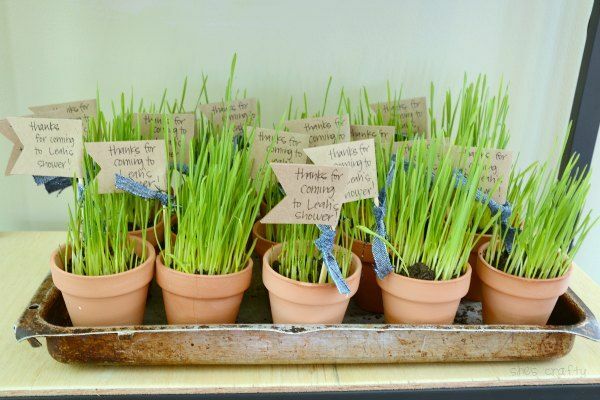 As a take home, I planted small clay pots with wheat grass. I made flags from kraft paper and tied some denim to the stick. 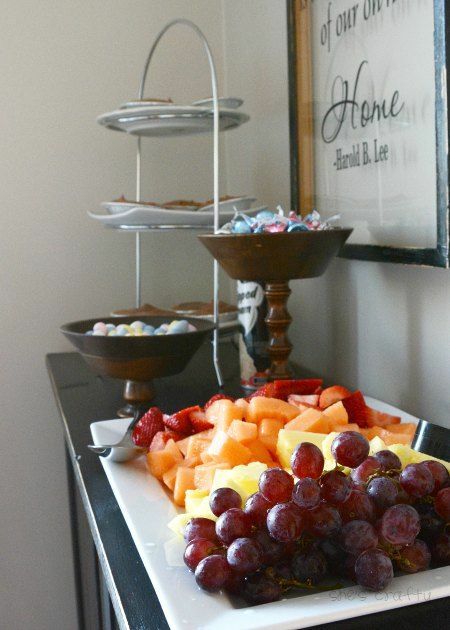 It was a small, intimate baby shower that was lots of fun to do! !